Hail Isis, First of the Divine Amongst Women! Your peace is with me, and I am with Your peace. Hail Isis, First of the Divine Amongst Women! Your love abounds, Your kindness grows, and in me Your Spirit flourishes. 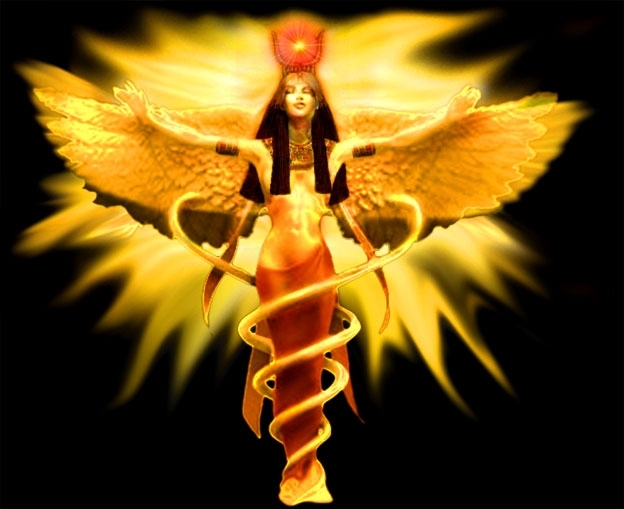 Hail Isis, First of the Divine Amongst Women! Whatever I touch is touched by You, for there is no heart in all of creation that has not been touched by Your love. Hail Isis, First of the Divine Amongst Women! I am Your lighthouse, the beacon of Your justice, generosity and salvation. Those who call on You cannot be lost. Those who live in You shall live forever. Hail Isis, First of the Divine Amongst Women! Blessed are You amongst the Gods, for the fruit which came forth from Your womb was the Sun. Hail Isis, First of the Divine Amongst Women! May my hands be filled with Your purpose and my feet strengthened with Your divine power, for You are the shield of the weak and the arm of the oppressed. Those who call upon You are not taken by darkness, but lifted into the embrace of everlasting life. Hail Isis, First of the Divine Amongst Women! May You walk with my heart and shape my life to Your purpose. I receive Your mercy, tenderness, solace and light, and to all I bestow these virtues, for You, my Mother, are the Great Mother of all beings. This entry was posted on April 28, 2014 by Metalgaia. It was filed under Egyptian and was tagged with isis, prayer. ISIS – the root Goddess of all Mediterannean religions, even migrating into Europe.